Though livestock farms have perfected mass production of meat, some of their practices are impacting the environment in devastating ways. The nitrates and bacteria from farm fertilizer and piles of manure are effecting waterways and polluting the air. While farmers maintain that they’re doing everything they can to prevent pollution — by planting grass strips, easing off on ploughing their fields, and employing new methods that hinder runoff — environmental groups, animal rights groups, and citizens are still bringing the issue to court. Des Moines’ water utility, for instance, must purify their water through an expensive system because of the nitrates farmers use. If consumed by children under six-years-old, those nitrates can diminish the oxygen in the children’s blood. According to the Environmental Protection Agency, almost 68 percent of the US’s waterways, including lakes, reservoirs, ponds, and rivers, are “impaired,” which means they don’t comply with water-quality standards and contain too many toxic elements to use. Farms are the main offender, mostly because the farms are mismanaged and located in areas more harmful to waterways. Over the years, pig farms have grown immensely. In the 1990s, almost 200,000 of the nation’s pig farms were family-run; in 2012, that number dropped to 21,600. A big motivator for this shift towards industry pig farms is Murphy-Brown LLC, which was bought by China-based WH Group. One of WH Group’s primary goals is to export pigs from the US to China because it’s less costly. Inevitably, this goal has spurred more production. Pigs produce enormous amounts of waste, which are stored in large ponds, altered with chemicals, liquified, and then used as fertilizer. For nearby residents, the manure not only smells, but the runoff can cause health problems, such as respiratory problems, sore throat, nausea, irritability in the eyes, and high blood pressure. While many large-scale operations manufacture meat that is affordable to the consumer, it seems it comes as a trade-off for the health and well-being of the environment and many of the consumers. The swine-disease that has been ravaging the US pork industry for over a year, porcine epidemic diarrhea virus (PEDv), is beginning to impact US pork exports and the global trade. PEDv, which only effects piglets and has no impact on human health, has killed millions across 30 states. US pork prices in the market have also caused US consumer pork prices to increase. In May, average retail was at an all-time high of $4.10/pound, a 15% increase from the same time in 2013. 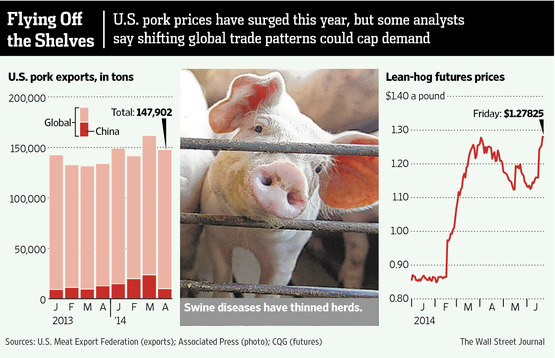 Increased pricing is persuading big buyers to import pork from other markets. Such a move will likely hit the US pork industry hard, since the US exports almost a quarter of its yearly pork production. PEDv is certainly a threat to the US pork industry, as the industry is known for low prices and large output. Skyrocketing costs in the US is reshaping global trade: other markets are stepping in and creating their own exporting opportunities. The USDA projects that US pork exports will plummet by 190,000 tons to 2.2 million tons in 2014. This April, exports to China dropped 13 percent from April 2013, and 37 percent from March 2013. China is the biggest global consumer of pork, and was the US pork industry’s third-largest importer from April 2013 to April 2014. The USDA reports that Brazil’s exports are expected to grow by 55,000 tons to a total of 675,000 tons. Canada’s exports increased by 16 percent from January to April, compared to export rates from a year earlier. The USDA also projects that Canada’s exports will grow by 20,000 tons to 1.3 million tons in 2014. A majority of these exports will be to the US and China. Europe’s pork industry has also become victim to disease, the African swine fever, which is disrupting its trade with Russia. Russia banned pork imports from the EU this past January. Similarly, China has placed a ban on pork imports from Poland. Japan’s pork industry has also been hit with PEDv, which has wiped out over 200,000 piglets since Fall 2013. With the lapse of government funding on October 1, the USDA had to shut its doors, forcing the department to discontinue updating prices for pigs in the cash market, which has caused an upheaval in the livestock market. Cash and futures markets use the USDA quotes as a reference point for trading. A lack of pricing means that the US’s largest meat manufacturers, Tyson Foods and Cargill — as well as the farmers and ranchers who sell to these companies — have no way of knowing how much they should be paying for pigs. Both companies have been looking to Urner Barry, New Jersey-based market-research firm, for similar information. Tyson and Cargill have presented farmers and ranchers with two options: either directly determine a price with the company, or use Urner Barry’s formula to calculate a price. But due to the USDA’s interrupted data stream, many traders are fearful of trading, causing trading volumes to decrease; after the shutdown, trading volumes in lean-hog futures dropped 40%. Sixteen days in to the government shutdown, Obama signed a bill into law that ended the it. However, it will take the USDA, meatpackers, and farmers and ranchers a period of time to recover from the dearth of information. Copyright 2013 All rights Reserved by Fluid Management Systems, Inc.